The COA’s various Committees are an integral part of the Association’s governance structure. They lead projects, policies, programs, and initiatives that support the COA’s Mission and Vision. Each Committee is made up of a chair and members selected by the COA’s Nominating Committee. Together, their interests and expertise contribute to both the COA’s and the Committee’s goals and mandates. All Committee positions are on a volunteer basis and serve a mandate of approximately three years, with the possibility of renewal. The Board of Directors or Executive Committee positions may involve longer mandates. COA Committees meet either in person or via teleconference at various times throughout the year. Doug Thomson: doug@canorth.org or 514 874-9003 x 5.
Who Are the COA Committees and What Do They Do? A brief description of each Committee is outlined below. If you would like further information or terms of reference for any of the Committees, please contact doug@canorth.org. The Executive Committee addresses issues related to planning, programs, staffing, and the implementation of the Board’s strategic direction. It is also responsible for overseeing the Association’s order and structure during the periods in between Board meetings. The Executive reviews financial statements on a monthly basis and receives staff reports on all COA operations. This ensures that the COA leadership remains current on the relevant issues in a timely manner. 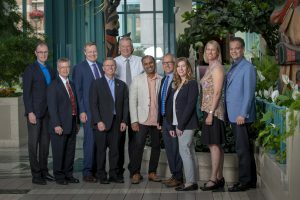 The Executive Committee is chaired by the COA President, and is made up of the President Elect, 2nd President Elect, Past President, Treasurer, Secretary, as well as the Chair of the Canadian Orthopaedic Foundation. The CEO and Executive Director, Strategic Initiatives also support the Executive Committee. The Executive meets a minimum of ten times annually, primarily by teleconference, with at least two in person meetings. The Board of Directors is chaired by the COA President and is made up of the members of the Executive Committee, regional representatives, and chairs of various Committees. 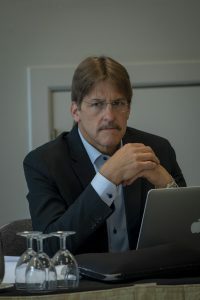 The Board oversees the general direction of the organization, represents the interests of the membership, and upholds the Association’s reputation on a local, national and international platform. The Board is responsible for setting long-term goals and objectives that govern the future direction of the Association. 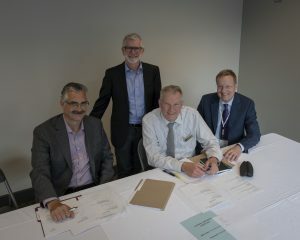 The CPD Committee establishes the COA’s overarching vision for orthopaedic education, and the method of its evaluation. The Committee oversees and manages the Association’s educational continuum, including the development and management of the Annual Meeting’s scientific program, continuing professional development (CPD), CME accreditation services, as well as collaborations with subspecialty societies, provincial orthopaedic associations, and affiliate groups. The Chair of the CPD Committee also holds a position on the Board of Directors. The Communications Committee develops effective internal communication programs that inform the membership of COA projects and programs, as well as current issues within the profession. The Committee is responsible for reviewing and developing content for the COA Bulletin, web site, social media, and other communications projects (newsletters, article submissions to other journals etc.). The Chair of the Committee also serves as the Editor in Chief of the COA Bulletin and holds a position on the Board of Directors. The Standards Committee provides members with relevant and up-to-date information on national orthopaedic care, ensuring that members have access to the best, evidence-informed practice models, new orthopaedic research, innovation, and technologies. The Committee recommends ethically-appropriate methods of introduction into clinical practice, and monitors their implementation. The Committee makes recommendations to the Board regarding the adoption of public position statements that inform members, and others, of the official stance of the Association on topics of concern. Examples of recent work by the Standards Committee include the statement on total joint patients having dental procedures, as well as the COA position statement on opioids and orthopaedic surgical practice. The Chair of the Standards Committee holds a position on the Board of Directors. The Membership Committee is charged with the recruitment and retention of COA members across all categories. The Committee monitors membership satisfaction levels, data, demographics, and trends in order to develop services and benefit programs that cater to all membership classifications. Applications and candidacy for COA membership are vetted by the Committee. The Chair of the Membership Committee holds a position on the Board of Directors. The Practice Management Committee identifies areas of economic, social, and political activity that impact the practice of orthopaedic surgery in Canada, and subsequently implements strategic initiatives within these areas. The Committee formulates policy recommendations, overseas fee schedules, negotiations and comparative economic data between the provinces. They determine and retain information on working conditions and practice satisfaction across Canada, evaluate outcomes of implementation of COA recommended Models of Care and/or Best Practices’ “Tool kits”. The Practice Management Committee membership includes representatives from each provincial orthopaedic association or society, which ensures real-time bidirectional exchange between the COA and the provincial organizations. An example of recent work by the Committee is the resource document Charter for Orthopaedic Surgeons that outlines the roles and responsibilities of orthopaedic surgeons to patients, society, the medical profession, and themselves in the planning delivery of MSK care. The Finance and Audit Committee is charged with reviewing the Association’s financial reporting and making recommendations to the Board that improve the timely and accurate reporting of the organization’s financial health. The Committee reviews the budgets and financial projections, as well as the audited financial statements submitted by the Treasurer. It also makes annual recommendations on the appointment or reappointment of auditors to the Board. The Committee provides policy advice to management on any financial-related matters, including the investment strategy for all long-term investments. The Chair of the Finance and Audit Committee also holds a position on the Board of Directors. The Nominating Committee develops a list of volunteers willing to serve on the various COA Committee positions as well as the 2nd President Elect position of the Board of Directors. 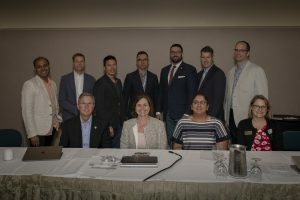 This Committee is unique, as its members are nominated directly by the membership at the COA Business Meeting each year, and is chaired by the immediate Past President. Through the members’ nomination of the membership of this Committee, they have a direct influence on the composition of the Association’s leadership. This Committee is responsible for the development, evaluation, and promotion of the various travelling fellowship programs offered by and affiliated with the COA. They review applications for travelling fellowship positions and select the successful candidates to represent the COA on a fellowship tour. 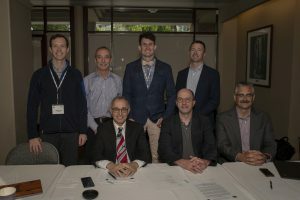 The Committee assists with the development of itineraries when Canadian orthopaedic programs and centres host visiting fellows participating in the exchange programs. The Exchange Fellowships Committee is made up primarily of members who have participated as COA travelling fellows in the past. The COA presidency has been maintained by a long list of leaders, visionaries and pioneers from across the country.